Legume cover crops are low-growing plants that are grown in association with grain and vegetable crops. Benefits of cover crops include adding N to soils, weed suppression, reduced soil erosion, and reduced N leaching. 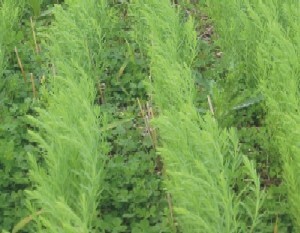 Cover crops are used all over the world. Cover crops can be grown after crop harvest to take advantage of heat and moisture before killing frost. Normally the benefits of this heat and moisture is lost to weeds. This table (at right) shows the number of growing degree days (GDD) and precipitation available after winter wheat harvest at various locations in Manitoba. 400 GDD are considered necessary to grow a late-season cover crop. A self-seeding legume growing under flax. Most cover crops need to be seeded each year. In high value crops such as orchards and vegetables, the additional seed cost of the cover crop may not pose a serious limitation to their use. However, in field crop production, long-term research has shown that the seed cost of the cover crop often equals the economic value of their benefit. One method to reduce the cost of cover crops is by developing a legume cover crop that is self-regenerating. A self-regenerating crop establishes and reproduces by itself. No seeding costs are required. The possibility of a self-regenerating crop almost sounds too good to be true. Very few crops grown in the world are self-regenerating. Self-seeding legumes have been used as cover crops in grain-pasture systems in Australia for over 40 years. North American researchers have been interested in using black medic for over 30 years. Dr. Jim Sims, Montana State University (retired) registered "George" black medic in the early 1980's. University of Manitoba researchers are testing black medic for use as a late-season cover crop. The above image shows black medic, a self-seeding legume, regenerating under a flax crop. As the flax continues to grow, black medic forms a low-growing living mulch under the crop canopy. After the flax is harvested, the black medic continues to grow and set seed until the first killing frost. This type of cover cropping is referred to as relay cropping. Producers in Europe, North Dakota, and Canada have already experimented with black medic as a cover crop. Organic farmers, in particularly in dry areas, have used black medic successfully as a self-regenerating legume during the summerfallow year. There are many questions related to using black medic as a self-regenerating cover crop. What are the effects of crop type and tillage on the emergence of black medic? When does the black medic hard seed coat fracture, allowing the seed to germinate and establish a seedling? How does black medic affect crop yield? 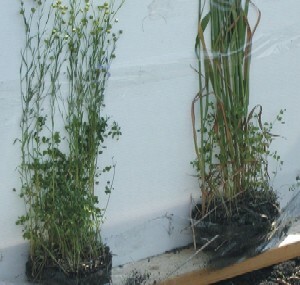 Black medic growing under flax (left) and oat (right). Figure 1 (below) compares black medic emergence under an oat and flax crop. In general, black medic emergence was greater under flax than oats. Competition for moisture and light was greater under the oats compared to the flax. 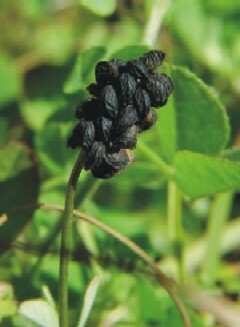 Black medic germination occurred primarily in the spring period, ending by early June. The drop in black medic density in mid May was caused by a pre-seeding glyphosate treatment. The effect of zero tillage (ZT) and conventional tillage (CT) on black medic emergence was also observed. Black medic emergence was greater under ZT than CT. This difference was caused by tillage which moved a large portion of the seed deeper into the soil profile. This seed did not germinate. Figure 1. Black medic density fluctuations under flax (navy line) and oat (purple line) at Winnipeg, 2003. When flax was grown without fertilizer N, the presence of black medic increased flax yield by 21%. The soil N input from black medic was responsible for this yield increase. However, when fertilizer N was applied, flax yield was decreased by 15% in the presence of black medic. A major concern is the weed potential of black medic when used as a self-regenerating cover crop. Observations during the past three years indicate that black medic is relatively easy to control with the right selection of herbicides and rates. Black medic was very sensitive to bromoxynil and a tank mix of glyphosate and 2,4-D. The development of self-regenerating cover crops is on-going. Most important is understanding more about the self-regeneration characteristic of black medic. This aspect controls when black medic germinates and emerges in the crop. We have also learned that the breakdown of the hard seed coat of black medic controls germination timing. Selecting different strains of black medic based on this characteristic will be the focus of future studies at the University of Manitoba. If moisture and heat are not limiting in your area try a cover crop after cereal harvest. For more information on using black medic as a self-seeding cover crop, contact the University of Manitoba. This page created August 2004.